If you want to experience an outdoor sport which challenges both your mental and physical capabilities, rock climbing is it. I recently participated in a basic 2-day rock climbing class offered by Joshua Tree Rock Climbing School. I found it to be one of the most challenging adventures I have ever experienced. When I first decided to sign up for the rock climbing class, I was concerned about how high we would be climbing during the course. I regularly hike, bike, walk, horseback ride, rollerblade and run, so I was confident in my physical capabilities. What worried me was my fear of heights. I decided to call the school and get some more details about their program before I made the final decision to sign up. After talking with Mark, who schedules all of the classes and is an avid rock climber himself, I learned that approximately half of the students who sign up for their classes are women. I also learned that most people who take the classes do not have any previous climbing experience. Mark reassured me that I didn't need to climb any higher than I was comfortable, so I signed up for the two-day Basic Rock Weekend Course, which costs $175. The students were instructed to meet at Turtle Rock in the Hidden Valley Picnic Area located in the north end of Joshua Tree National Park. As I drove into the park towards Hidden Valley, I was mesmerized by the huge boulder outcroppings and the unique Joshua Trees that were abundantly scattered throughout the park. Mojave Yucca, creosote and other common desert shrubs covered the sandy ground, leaving only large boulders and rocks piles uncovered. The course was scheduled to start at 8:00 am sharp, and I reached the designated meeting area a few minutes early. It was a cool October morning, and the other students began to arrive in pairs, all dressed comfortably in sweat pants, long sleeve shirts, warm jackets and charged with anticipation . We found a big, flat boulder to sit on in the sun, while we waited for our climbing adventure to begin. Mark, Pat and Spencer introduced themselves as our rock climbing instructors and began the class with an overview of the program. Our instructors were very enthusiastic and immediately put me at ease. They told us about their climbing experience and how they first became interested in climbing. It was obvious they were all passionate about climbing and excited to be teaching others about the sport. As I listened to their stories about climbing, I realized that climbing wasn't just a hobby or sport they participated in -- climbing was their way of life. After the introductions, we were fitted with climbing shoes and harnesses, then split into two groups. One group of seven went with Mark and Spencer, while the remaining four students went with Pat. I was in the latter group with climbing students Stephanie, Jay and Mark. Pat started our group with "bouldering," which is a great method for learning climbing techniques and how to use the tight-fitting climbing shoes. Bouldering is a sport which has become very popular over the years and incorporates the same techniques and problem solving skills as rock climbing, only on smaller boulders. Mark, Jay, Stephanie and I took turns spotting each other as we implemented the climbing techniques Pat had demonstrated. Spotting a climber is similar to spotting a gymnast. The spotter can't always stop your fall or catch you, but they can control the way you land if you fall. While bouldering, we learned balance, energy conservation, foot and hand positions and other climbing techniques. Throughout the morning, Pat provided us with a wealth of information about the sports of bouldering and rock climbing. We learned that Joshua Tree National Park is a world-class rock climbing area and attracts famous climbers from all over the world. 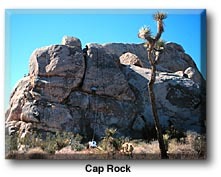 Joshua Tree has approximately 5,000 documented rock climbing routes and numerous bouldering problems. A local climber by the name of Alan Bartlett is well known for having climbed the most routes in Joshua Tree -- his current count is approximately 3,000. After bouldering, Pat introduced our group to the climbing equipment we would be using later in the day. He explained how the climbing ropes are made, including the basics of rope care and safety. Next, we learned how to put on our safety harnesses, which is a critical step since the equipment will not work if it is not properly worn. Pat kept reiterating the importance of double checking our equipment before each climb. We were responsible for checking ourselves, each other and then he would inspect our gear again, before each climb. After our harnesses were safely fitted, Pat taught us how to tie a figure eight knot, which we would use to tie into a top rope. This is a safe form of anchored protection. On a top rope set-up, the climber is tied into one end of a climbing rope which runs up to a secure anchor at the top of the route, through two carabiners, which together serve as a pulley and back down to a vigilant belayer. The belayer is the person responsible for taking up slack in the rope as the climber ascends a route and is prepared at all times, to lock off the rope should the climber fall. The belayer is equipped with a belay device which applies friction to the rope when it is positioned in the break position. This enables the belayer to slow the rope down or lock it off should the climber fall, even if the climber exceeds his or her own weight. It was time to practice what we learned. We partnered up and tied into the ropes , one partner representing the climber and the other the belayer. Pat instructed us on how to give out and take in the ropes without removing our hands from the rope. After a few tries, we were all comfortable with the system. When we returned from lunch, we packed up our gear and headed on foot toward Hidden Valley, one of the most popular rock climbing and bouldering areas in the park. Pat selected Sports Challenge Rock for our first climb. He took his gear and climbed up to the top of the rock to set up the top rope above the unmarked route we were nervously preparing to climb. Pat rapelled down the face we would soon climb. He was completely at ease and made the decent effortlessly. Our group was charged with anticipation as Mark, my climbing buddy, volunteered to be the first climber of the day. He climbed over the boulders and tied into the top rope. After checking his equipment, Pat returned to the belay station where he would demonstrate how the belayer and climber were to communicate throughout the climb. There is a specific etiquette and set of verbal commands used to ensure the belayer and climber are in sync. Mark yelled "On belay?" 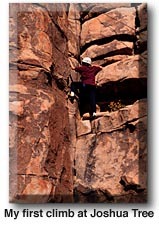 This first command is given by the climber, when he or she is ready to start the climb. "Belay is on," Pat replied, which indicates to the climber that the belayer is in position and ready to lock the rope if he should fall. Mark then indicated he was ready to start climbing by saying "Climbing." Pat responded with the words "Climb on," which signaled Mark that he could start the climb. Mark faces the wall and bravely takes his first step onto the granite route before him. Pat coaches him from the belay station as we all fix our attention on Mark. "Trust your feet," Pat yells as Mark hesitates on a foot hold. "Put your left foot where your knee is and smear." Mark just laughed because he couldn't see anything to put his foot on, no edges, no cracks. Mark takes the step and smears (a friction foothold). It worked. We all cheer and congratulate Mark for trusting his feet. Mark reaches the top of the route and turns to wave. "What am I supposed to say," Mark asks as he looks down at the group. Pat reminds us that "Take" is the climbers command to the belayer when he is ready to descend. This indicates to the belayer to take up any slack and put the rope into the break position preparing to take the full weight of the climber. When the belayer is in position, he responds with "Give me your weight." Mark puts his full weight into the harness and pushes his upper body away from the rock with his feet firmly planted in front of him, slowly working his way safely to the ground. Mark handed me his helmet and tied into the belay position; it was my turn to climb. I worked my way over the boulders to the base of the route and, with shaky hands, threaded the top rope through my harness and tied a figure eight knot. After Pat double checked the equipment, I nervously called "On Belay" and Mark replied "Belay on". My hands were trembling as I faced the rock. I must have called "climbing," because Mark yelled "Climb on." I started my ascent. I couldn't believe I was doing this. Just a few weeks earlier , I had climbed up the Chichen-Itza Pyramid in Cancun, Mexico and became terrified at the top. I wouldn't even walk to the edge to descend the steep stone stairs. I crawled. I did manage to get down, but I kept repeating to my friend that I didn't know how I was going to manage rock climbing if I was so afraid of heights. The class was only two weeks away. "Reach for that crack with your right hand," Pat coached, "no your other right hand." "Sorry, I get my left and right confused. I am a bit dyslexic," I yelled down. We all laughed, because even if you don't get your left and right confused, when you're on a rock 50 feet above the ground and scared to death, you get everything confused. Arriving at the midway point, Pat told me to, "Stop and test the system. Let go and give Mark all of your weight." Clinging to the ledge with my feet, I let go with my hands and pushed back into the harness. It held -- yes the system does work. By learning to trust the system, you can focus less energy on falling and more on your climbing technique. Even though I tested the system and felt sure it was safe, my legs were still quivering. I pulled back onto the ledge and continued my climb upward, anxious to finish the climb. There were plenty of hand and foot holds, and I quickly reached the top. Jay called, "Turn around and wave", and somehow I managed a partial smile and a brief wave of the hand. "I'm ready to come down, what am I supposed to say?" "Take," Pat yelled. We all laughed, because everyone forgot what they were supposed to say. We were either too nervous or exhilarated by the achievement of our first climb to remember proper etiquette. "Take," I shouted. Mark responded, "Give me your weight," and I began my descent. Shortly, my feet touched the ground, and with great relief I said, "Off Belay." Mark replied,"Belay off," and fed me slack so I could undo my figure eight. Stephanie and Jay successfully made their first climb of the day, and we all repeated the route utilizing some new techniques. After we had each climbed the route twice, Pat moved the top rope to a new route on the same side of the rock. It was a higher and more difficult route than the one we had just completed. Jay, Stephanie and Mark preceded me on the second route, all reaching the top with smiling faces. It was my turn, and I wasn't feeling very good about this climb. It wasn't that the route was too difficult, I just didn't feel right, I was losing confidence. Mark had to help me tie my figure eight since I was so distracted with fear. I felt like I was on the verge of tears before I even started the climb. I don't remember who my belayer was, I climbed a third of the way up and could not control the tears. I had lost the edge. I returned to the ground and called it a day. I needed to come back another day when my courage did not elude me. Here I relaxed while Jay, Stephanie and Mark ascended the route a second time, all enjoying the wonderful and exhilarating experience of rock climbing. Earlier, Pat told us there were days when he would ask himself, "What am I doing here?" He said there will be times when you just don't feel right, but you come back later and try again when you are feeling stronger. I remained a spectator for the rest of the class, including the second day. I was feeling down about not completing the class and I had to remind myself that it takes more than a day to conquer one's fears. I had climbed one route twice, which was more than I had anticipated achieving prior to taking the class. The second day of class arrived, a sunny Sunday morning. Both groups met at the same location, and it was decided that we would all climb together at Cap Rock. Spencer and Pat set up the top ropes for three different rock climbing routes and one bouldering problem. The class walked to the rock face, where the routes were set up with top ropes, and stared silently at it. These routes were definitely higher and more challenging than the bunny slopes conquered yesterday. One by one, the students tied in and began their first climbs of the day. There were three belay stations, each with an instructor to coach the climber and belayers. No one climbed without Pat, Spencer or Mark first checking their harness and figure eight knot. Each belayer was checked as well, leaving no room for error. I was impressed when Stephanie selected the most challenging of the three routes for her first climb. She was the first to climb the called the "Event Horizon" and set the stage for the others, who accepted the challenge and also made the climb. Just about everyone climbed all three routes, with some students climbing them twice. Spencer guided some of the students as they climbed the boulder problem, which was set up with a top rope to ensure safety. The boulder route followed a large crack that required using your hands by jamming them in the crack. By the end of the day, most of the students had war wounds to show for their effort. Throughout the day there were cheers of encouragement, pats on the back and numerous "thank yous." Thank you for catching me, thank you for saving my life, and thank you for paying attention while I hang from a rope 80 feet above the ground, clinging to the face of a rock and balancing with one foot on crystals so tiny you would need a magnifying glass to see them. Yes, it is proper etiquette to thank your belayer when you safely complete a climb. It was near the end of the day, and many of the students were tired after two full-days of physical and mental challenge. As we packed up our gear and headed back to the parking lot, our group reflected on what we had accomplished. Some of the students hadn't expected to do as much climbing as they did and felt a sense of great accomplishment. They climbed higher and more difficult routes than they had imagined possible, and after only two days of instruction. 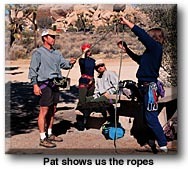 Many of the students had plans to return to Joshua Tree and rock climb again. Others said they had fun and enjoyed the experience, but didn't think rock climbing was a sport they would pursue. We all walked away from this experience having learned something new about ourselves. To me, rock climbing is about conquering my fear of heights. Rock climbing forced me to face my fear, and yes it scared me, but I now feel more confident that I can overcome it. I plan to return Joshua Tree and climb again. In the meantime I will do some bouldering and work on the techniques I learned during the class. If you decide you would like to try rock climbing, I highly recommend you sign up for a class with Joshua Tree Rock Climbing School. I was impressed with their program and felt they did an excellent job making sure we had a safe and enjoyable experience. If you select another school or guide service, make sure the guides are certified by American Mountain Guides Association (AMGA). In the U.S., certification is voluntary and not required. Good luck and happy climbing. © Article copyright The New York Times. All rights reserved.